Cloud web hosting services is internet based services which provides hosting websites on virtual servers which pick their computing resources from several clustered web servers. The cluster of servers is the cloud. The security is taken care, load is balanced, and hardware resources are accessible virtually so they can be used when required. Cloud web hosting is immense solution for websites that have exceeded the resources of their current shared hosting provider. What is Amazon Website services ? 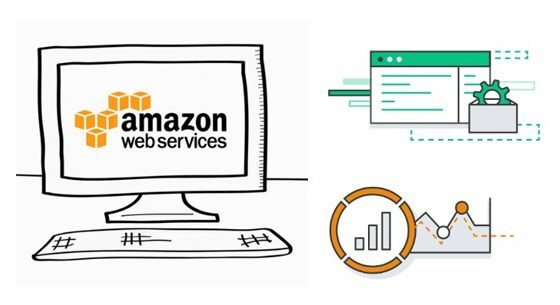 Amazon Website Services (AWS) are a cluster remote computing service that administers cloud computing infrastructure over the Internet with bandwidth, storage and customized support for application programming interfaces (API). Amazon AWS service provides large computing capacity cheaper and quicker than a client company building an authentic physical server farm. The prime motivation of amazon AWS services is to create a platform where ISVs and vendors could smoothly, safely, swiftly host their apps. Today, AWS reaches its goal, for both new SaaS-based apps and existing apps. The major networking and computing tasks covered by AWS are, establishment of firewalls, supply of virtual servers, allocation and routing of IP addresses, etc. AWS helps to customize the resources as per the individual project requirements. It also supports the auto-scaling to build a self-managing infrastructure adjusted to the actual need. AWS helps the developer choose an operating system, programming language, web application platform, etc. this supports the easy migration to the new app. AWS has a highly secure infrastructure that undertake both physical and software measures to secure both web and app. AWS resources can be restricted by employing IAS where distinct roles can be traced in varying privileges. Access Management (IAM), Leverage Identity helps to track the activity done by different users. AWS adapts pay per use policy, it allows you to pay for the resources that is being used. Which includes computer power, backup, storage and other tools. One of the important advantage of the AWS Economics Center is, it provides a comprehensive view of various pricing options.